My parents and two youngest siblings’ flight back to Manila was at 10am while mine and Rob’s was at 5pm. Rob and I ate breakfast at the McDonald’s in Bugis Junction, went to Sim Lin Square, ate lunch at the McDonald’s in Bugis Junction, then caught a cab to the airport. The concierge at Ibis kept our bags after we checked out at 9am so that we could wander around. I bought a BlackBerry Curve 9300 in Sim Lin Square! Yahoo! Got it for around Php 4,000 less than what it usually sells for in Manila. Now the downside: we spent three hours going around the place and I lost my patience with two vendors. My infuriating experience prompted me to write an article detailing how I to get f*cked over while shopping in Sim Lin Square. Read it here. The departure area of Singapore’s Budget Terminal was a nice place to wait. But then again, I’m used to NAIA so an airport with comfy chairs, clean bathrooms, and decent food already passes with flying colors. LOL. My only complaint is that there were too few chairs. Bought siopao to eat on the way home. Dear Philippine Customs Officer, young man + young woman + traveling together DOES NOT EQUAL A ROMANTIC RELATIONSHIP. JFC the customs guy thought Rob was my husband. EWW EWW EWWWWW!!! We got a later start that day, having lunch at the Bugis Junction mall before my brother Jay and I separated from the rest of the family to go to the Singapore Zoo. I was the only one who hadn’t been to the zoo – they went there during the Singapore leg of their Asian cruise last 2008 – but Jay went with me anyway because he wanted to see the animals again. The Singapore Zoo is out of the way compared to the other must-visit places in Singapore, requiring a 30-minute MRT ride from Bugis to Ang Mo Kio station and another 30 minutes on the 138 bus. What the guides don’t tell you is where the bus stop for the 138 bus is – it’s the big bus terminal across the street from the MRT station. We ended up taking a taxi to the zoo from the station (S$9. 40) after not finding the right bus stop after 15 minutes of looking. We got there are around 1:30pm, leaving us 4.5 hours to look around (the zoo closes at 6pm). 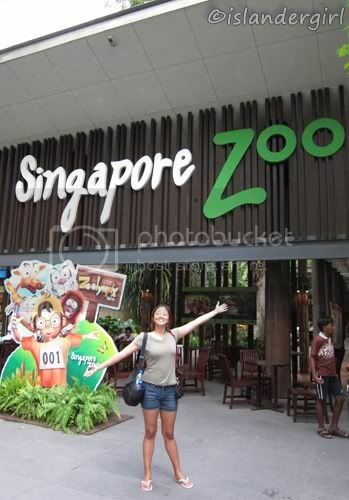 Basic entrance is S$20 per adult, though you can opt to get the Zoo-per Saver pass (S$27 for adults), which gives you admission + unlimited boat and tram rides, or the Park Hopper pass (S$58), which gives you admission to the Singapore Zoo, Night Safari, and Jurong Bird Park. If you’re going to be in the zoo for the entire day, I suggest getting the Zoo-per Saver pass. The tram saves you some walking time between exhibits and the boat ride takes you around the perimeter of the park (and it looked like a lot of fun too). 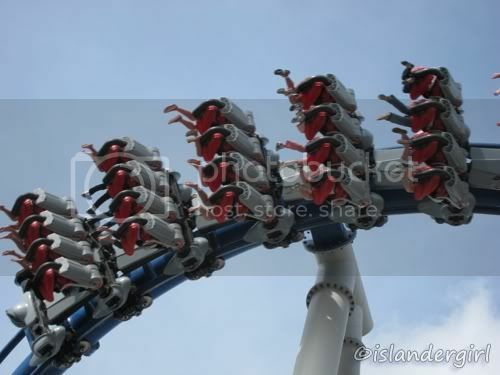 Battlestar Galactica – the world’s tallest dueling roller coasters at 42.5 meters tall! 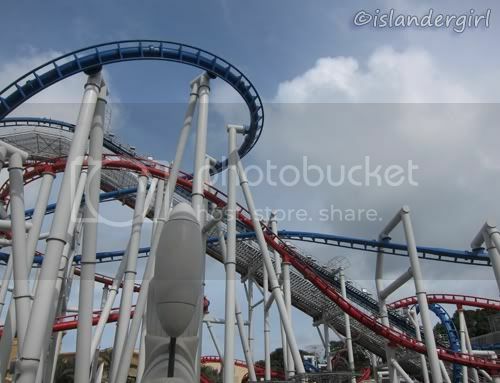 Choose either the Human or Cylon track: the Human track is a seated coaster that travels at 82.8 kph but with no inversions, while the Cyclon suspended coaster goes through five inversions, including a corkscrew and a cobra roll. My sister and I rode the Cylon track first, caught our breath for 5 minutes, then rode the Human track with our brothers. Have I mentioned how much I love roller coasters? 😀 Though looking back, I would recommend a 10-minute break between rides. Return of the Mummy – a roller coaster ride in the dark. Basically it’s Space Mountain but with physical effects like fire and great set design. 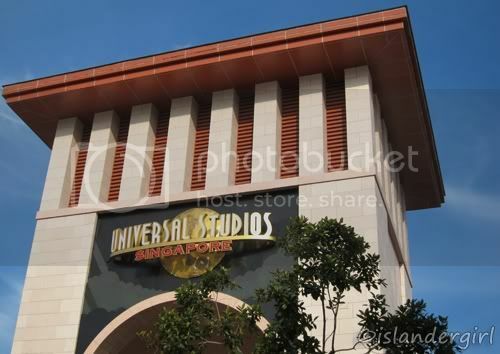 Shrek 4D theater – a 3D movie with special effects. Nothing unusual here. There are stationary seats inside the theater for people who’d prefer not to get shaken around. The host just outside the theater doors was highly amusing. Jurassic Park Rapids – a water ride with a long plunge at the end. To be honest, the only exciting part of the ride was the flume at the end. Well technically, we didn’t have a “Day 1” since we landed in Singapore at 1am on May 21 as were were on the last Cebu Pacific flight out from Manila. My mother thought that my brother Robbie would choose to work on Friday and only take the next Monday off so she booked the two of us for the 9pm flight. I got roped into taking the late flight so that my brother wouldn’t be alone. Had dinner in the Japanese place inside NAIA Terminal 3 (the food was so-so) before flying out. Reminder: just because you checked in online and don’t have baggage to check doesn’t mean that you don’t need to show yourself at the check-in counters. I landed at 1am and experienced the Singapore Budget Terminal for the first time (my last two visits to Singapore involved Singapore Airlines so I passed through Changi Airport). Of course the Budget Terminal isn’t as awesome as Changi Airport (how do you compete with free WiFi, computer terminals, and city tours, floors of duty free shops and restaurants, lots of comfortable chairs, and a giant slide?) but it certainly wasn’t shabby. In fact, the Budget Terminal reminded me of NAIA Terminal 1 but better: better lit, better food, and better airconditioning. It’s very disheartening to know that the Philippines’ main international terminal is equivalent to the budget terminal of our neighbor. We arrived at the Ibis Hotel on Bencoolen by 1:30am. Robbie was ecstatic when he found complimentary WiFi in the room. As my brother wasn’t going to let me use his precious MacBook, I was ecstatic to see free Internet terminals in the lobby. The room was just right for the two of us, though I wished for a little more space between the foot of the bed and the wall with the TV. The amenities were scarce – only shower cap, soap, shampoo/body wash, towels, coffee and tea service, and in-room safe – but the room was only US$125/night (no breakfast) via Agoda so I can’t complain. The hotel has a great location. It’s very hear a Hindu temple, a Buddhist temple, and Chinese traditional medicine stores if you want to soak up some culture. 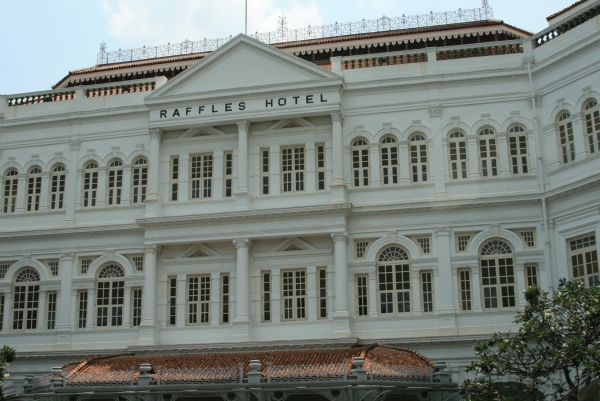 The Bugis MRT station is about three blocks away. Bugis Market, Singapore’s answer to our Divisoria, is only two blocks away. We zonked out after washing up but were rudely awakened at 7am by a too-loud telephone to go to Universal Studios.